Summer is almost here and warmer temperatures mean you’ll be looking for ways to cool down while sitting around the pool or enjoying the family barbeque. We can’t think of a better solution than sipping on a glass of refreshing cold brew coffee! Cold brew coffee has become a popular beverage in the US the past several years and continues to grow in popularity. Coffee chains have been capitalizing on the cold brew craze by adding varieties of cold brew coffee drinks to their menus. But you don’t have to spend $4 to enjoy a cold brew coffee! It’s just as easy to make right at home. When you say “cold coffee” the first image that may pop into your mind is a glass of coffee on ice. For the most part, iced coffee is coffee that’s been brewed hot and then put in the fridge to cool down. It’s then served at room temperature over ice. Iced coffee has been around since the 1800s, and is a method traced back to an Algerian drink called Mazagran. The Portuguese had a similar iced coffee that they would add lemon, mint or even rum too. Sounds delicious, and it is, but it’s not to be confused with cold brew coffee. Cold “brew” coffee doesn’t refer to the coffee itself but to the process of how the coffee is brewed. Cold brew uses time in the place of heat for brewing. When you brew coffee with a traditional drip machine, the water is heated from 170 – 210 Fahrenheit. Brewing with heat draws out several compounds from the coffee grounds, like oils and fatty acids. This is what gives coffee its bitter element. Because cold brewing doesn’t use heat, the bitter oils and acids are not extracted from the ground coffee. The result is a smooth and sweet taste experience. Cold brewing produces a coffee concentrate, which makes it great for storing and using whenever you have a craving for a refreshing glass of cold coffee. Just mix equal parts of coffee and water. Depending on the strength of your concentrate, you can add more water or other liquids to suit your personal taste. Take your coffee to the next level by cold brewing. Discover the rich, smooth flavor that you can’t get from a typical hot cup of coffee. What’s The Origin of Cold Brew Coffee? If cold brew coffee tastes so great, why are we just hearing about it in the 21st century? Well, cold brewing coffee is certainly not a modern process. It’s actually been around for hundreds of years. 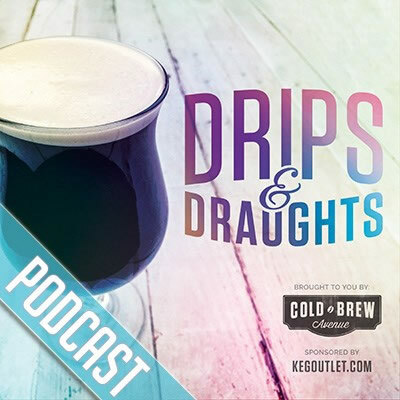 In an article published by Daily Coffee News back in 2014 on the history of cold brew coffee, they offer a number of theories on the origin of cold brew. One theory is that it was the Dutch, who in the 1600s used a cold brew method for transporting coffee on long voyages. They may have also introduced this method while trading with the Japanese. Although, the Japanese were already brewing tea using a similar method. The article also mentions methods of cold brewing found in Latin America, but the details are not as certain. The most common use of cold brew coffee was found among soldiers military rations. A soldier could reconstitute the coffee concentrate while out in the field for a much-needed caffeine boost. By WWI instant coffee would replace the cold-brewed concentrate as a standard for a soldiers rations. Whatever its origin, we’re just glad cold brew coffee has been revived and we can enjoy it anytime we like. Question 1: What is the best roast level for cold brewing? The best roast for cold brew is really up to your personal preference. Just realize, that your favorite roast level for hot coffee may not be the same for cold brew coffee. There are two points in the roasting process when the coffee beans will literally “crack”. The first crack happens when the coffee beans are heated to about 385 Fahrenheit causing moisture to evaporate from the beans. Hearing this first crack tells the roaster that the beans have reached the “light roast” stage. Dark roast begins around 435 – 437 Fahrenheit when a second crack occurs. The second crack is when the oils rise to the surface of the coffee bean. For cold brew coffee, the light to medium roasts will usually need a longer brewing time to draw out the beans flavors since the oils have not been released during roasting. Remember, there is no heat in the cold brew process to draw out the oils. For that reason, darker roasts are preferred because of the richer flavors it produces. Brewing small batches is a great way to experiment and find the perfect roast for your tastebuds. Question 2: What level of grind should I use for cold brew coffee? Freshly ground coffee beans are the recommended way to go. You can use pre-ground if that’s what you have, but the flavors and aromas will not be as strong. The longer ground coffee is exposed to the air, the more diluted the flavor becomes. So, why grind coffee in the first place? Just placing whole beans in water would take a very long time to brew and would produce a very weak coffee. Grinding coffee beans increases the surface area so that more flavor can be extracted. Basically, the more of the bean that is exposed to water, the better the flavor and aroma will be. The size of the grind you use is important. Grinding your coffee beans too fine can slow the brewing process. Cold brewing works best with a coarse grind. A course ground will help extract all of the wonderful coffee flavors you’re working so hard to enjoy. There are a number of different methods for cold brewing your coffee. The one that’s best for you depends on experience and how creative you want to be. If you have money to burn you can purchase a cold brew tower. Prices can range from $25 to $500. Towers have a glass bowl at the top where you add ice. Filtered water is poured over the ice and drips through into the coffee grounds where it slowly brews into a base. Not ready for the tower? Here are three of the best ways to prepare cold brew coffee at home. Using a Mason Jar For Cold Brew Coffee. Making cold brew coffee with a mason jar is great for beginners. It’s one of the easiest methods because most of the equipment you need is already in your kitchen. Simply stir coffee grounds into a mason jar filled halfway with water. Put on the lid and place in the refrigerator for 12 to 24 hours, depending on how strong you want your brew to be. Then pour the coffee concentrate over a paper filter, straining it into another jar or bowl. Store your cold brew coffee in the fridge, where it’s ready to enjoy. Use about 4oz (1 – 1 1/2 cups) of coarsely ground coffee beans. Pour the grounds into your mason jar and fill it halfway with cold (or room temperature) water. Gently stir the mixture to ensure all the grounds are wet and then fill the jar the rest of the way with water. Put the lid on the mason jar with the coffee mixture, and place it in your refrigerator. Allow the coffee to steep for 12 to 24 hours (times may vary). Be aware that the longer it steeps, the stronger your coffee will be. After the 12 to 24 hours steeping time, set your strainer over the large bowl and place a coffee filter in the strainer. Pour the cold coffee mixture through the filter to catch the grounds. Rinse your jar out, and transfer the cold coffee from the bowl back into the jar for storage. It may be called a “French” Press, but the first patent filed in 1932 is held by an Italian designer named Attilio Calimani. It’s become known as the “every man’s coffee pot.” It’s a simple design; a circular beaker with a lid and plunger. Under the plunger is a screen that’s used to push the coffee grounds to the bottom of the press after brewing is completed. Today you can purchase a French Press for less than $10. Add 4 Oz of course ground coffee to the bottom of the French Press. Pour 3 cups of cold or room temp water over the grounds gently. Gently stir to get all of the grounds wet. Let sit for 14-16 hours at room temperature. Press and strain into covered jar or vessel for storing your cold brew in your refrigerator. You now have a cold brew concentrate: Mix 1 part coffee with 1 part water when serving. If you’re not keen on using a mason jar and want to keep your French Press exclusive for brewing hot coffee, then a cold brew decanter may be the perfect solution. Decanters will infuse your coffee, then filter it after steeping. The convenience of closing the lid and storing inside your refrigerator makes decanters great for home brewing. Here at Keg Outlet, we like the Takeya Cold Brew decanter. Add 14-16 tablespoons of coarsely ground coffee into the infuser. Twist infuser into the lid. Shake well and place in the refrigerator 12-24 hours. As you can see, there are several options to enjoying cold brew coffee right at home. Whichever way you choose, mason jar, french press, or decanter, we know you’ll enjoy adding cold brew to your coffee routine. Download Our Ultimate Guide To Cold Brew Coffee & Serving Coffee On Draft For Free! Want to know more about Cold Brew Coffee? 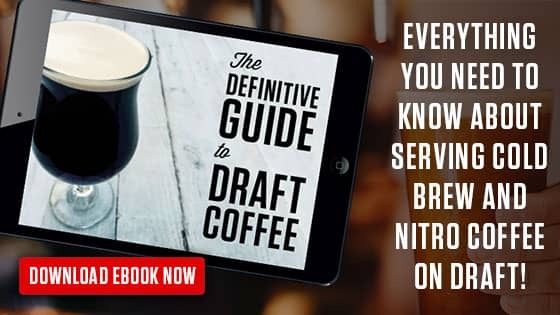 Our Ultimate Guide To Cold Brew Coffee and Serving Coffee On Draft covers all the equipment you’ll need for small to large batch brewing, water to coffee ratios, and even how to serve coffee on draft. It’s almost 40 pages packed with “How To” Cold Brew Content! To find out what’s in this awesome guide and how you can get it for FREE, click the link and it will take you directly to the info page. Cheers!